With an oral examination and x-rays of the mouth, Dr. Gustave can evaluate the position of the wisdom teeth and predict if there are present or future potential problems. Studies have shown that early evaluation and treatment result in a superior outcome for the patient. Patients are generally first evaluated in the mid-teenage years by their dentist, orthodontist, or by an oral and maxillofacial surgeon. 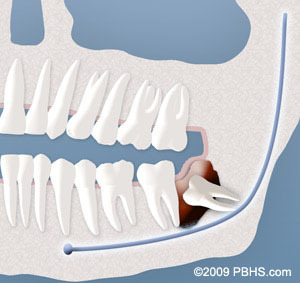 Impacted wisdom teeth may contribute to crowding of your teeth. This is most noticeable with the front teeth, primarily the lower front teeth and is most commonly seen after a patient has had braces. There are a number of factors that cause teeth to crowd after braces or in early adulthood. Retained, impacted wisdom teeth may be a contributing factor. Unless you have an active problem when you see Dr. Gustave, the reason for removal is primarily to prevent long-term damage to your teeth, gums and jaw bone. The fee for your treatment is determined by a number of factors. 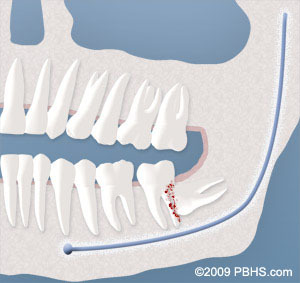 These may include the difficulty involved in removing your teeth and which type of anesthesia is best for you. During your consultation appointment, Dr. Gustave will need to review your x-rays, complete an examination and determine the best option for anesthesia, before an accurate estimate can be provided. Every insurance company has a different policy regarding the extent of coverage for a given surgical procedure. Dr. Gustave’s office staff will help you obtain maximum insurance coverage for your treatment. At the time of your consultation, your specific situation will be discussed in greater detail. We encourage you to ask any questions you may have. If new questions arise after your consultation, please call our office at Carbondale Office Phone Number 618-529-2571 to speak to one of our patient care coordinators.